We love to work with analogies because they help people understand even the most complex ideas and concepts. Let’s start this article with a basic question: What would you need to build a house? I’m sure there are several components that come to your mind immediately: a foundation, bricks for walls, roof tiles… The combination and arrangement of all these elements is what we call a structure — “an arrangement and organization of interrelated elements in a material object or system, or the object or system so organized” (Oxford English Dictionary). 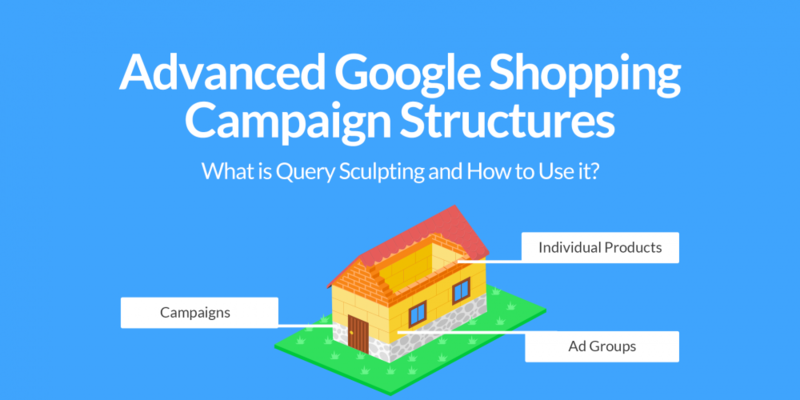 Similarly, structure in regard to AdWords and Google Shopping describes how your account is built up: namely which campaigns, ad groups and product groups there are. While text ads are eligible to show only if keywords match queries, Shopping ads show for any search query that matches your product — keywords are simply not part of the Google Shopping structure. Instead, each single Shopping ad represents one single product (ID) in your product feed. You can’t trigger the impression of your ads with keywords because the items are matched to the search query by Google. But: you can make use of negative keywords and priorities. You can use them at the campaign level to make sure ads are highly relevant and drawn from the right campaign. Keep this in mind for later. At the first glance, automatic query matching might sound great. If you use text ads, generating and analyzing keywords and then matching them to the most relevant ad is almost 80% of your work. Google Shopping is different: Google has taken over the steering wheel and made YOU a passenger. You have almost no control mechanisms left and it’s time-consuming to bid on single products. Not cool! In our award-winning talk at the HeroConf London 2016, Christian Scharmüller coined the term “Black Box Bidding” to describe this problem: you are not able to distinguish between individual products, devices and search queries. As an experienced PPC marketer, you know that there are differences. Here’s news: there is a way to reclaim the driver’s seat. 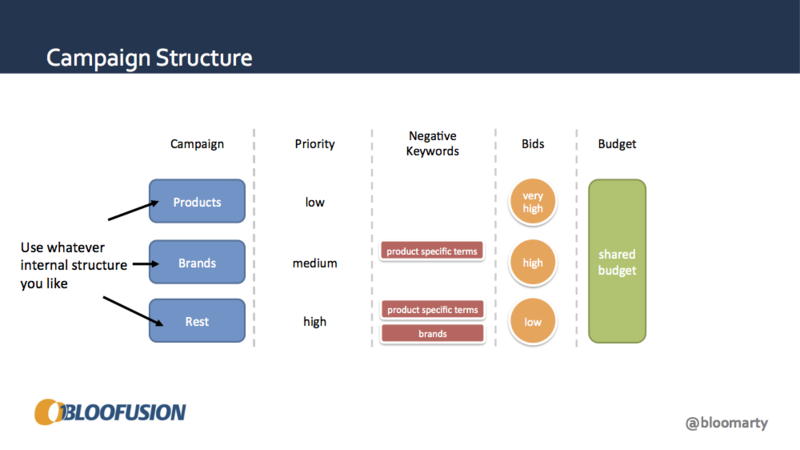 You can influence and control your campaigns and bids with the right campaign structure — But before you start hacking your account, let’s take a closer look at these three Google Shopping dimensions. 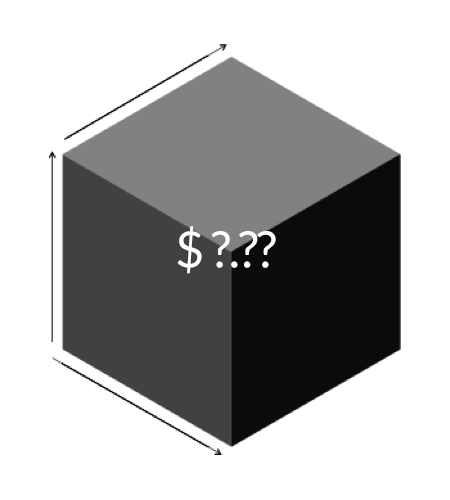 If you want to avoid black box bidding, you need to think about the three dimensions of a Shopping campaign first. These three dimensions are: (1) SKUs, (2) Devices and (3) Queries. These three parameters allow you to get back in control of your Shopping campaigns — Let’s reclaim the driver’s seat! The goal here is to make your campaign as granular as possible. Why? To avoid misleading conclusions. A short example: you target product types e.g. running shoes. You take a look at the ROAS of this specific product group and see a quite solid 10 — nothing to worry about, right? But then you start to dig deeper and encounter this scenario: two of your products are performing well (as expected), but one product completely skews your statistics. Without this badly performing product, the product group would have a ROAS of 38. The lesson: while this setup may save you time, you can’t spot and act on badly performing SKUs easily. Bidding on sub-divisions (or all products) always signifies a trade-off between workload and performance. The next dimension is quite easy to explain: the conversion rate on mobile is typically much lower than on Desktop, but this is not the case for every product. Therefore, item bids need to be adjusted to the performance differences between mobile, tablet and desktop. How? Bid modifiers would be your first guess, right? The problem: device bid modifiers are only available on campaign and ad group level. This is another reason why you should make your campaign as granular as possible. To set bids for every SKU and device, you can add one SKU per ad group, or manage bids with three device-specific campaigns. Before diving into facts and theory, I’ll show you a real-life example: below you see a regular Shopping ad and the queries it is triggered by. For example, a broad-match query like “Men’s Running Shoes”. 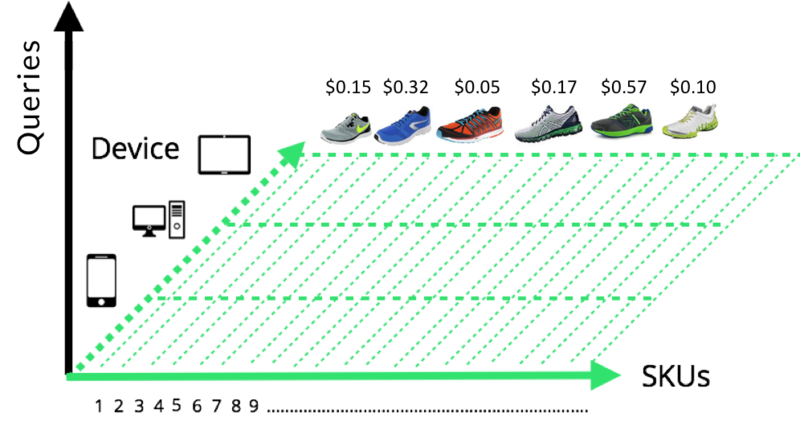 The more detailed the search (“Nike Free 5.0”), the higher the chance of a conversion. Let’s have a look at the CPC: it is significantly lower than the others. More generic queries have a much lower conversion rate and higher CPC. Sculpting queries means applying right bids to shopping queries by using several campaigns, campaign priorities and negative keywords to improve the performance. I’ll show two approaches how to set up such a structure, both based on this concept. In Google Shopping you have the possibility to use negative keywords to manage your campaigns. Why? 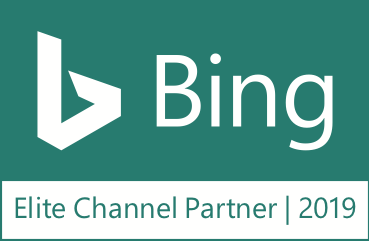 Because you want to exclude queries that do not fit your business strategy. If somebody is looking for “expensive jewelry” and you’re a retailer that sells low-budget products, it wouldn’t make sense to bid on this query. Now a little (well known) hack: you can also use negative keywords to structure your account in Google Shopping. The idea behind using negative keywords to structure campaigns is to transfer the AdWords concept of keyword matching to Google Shopping. 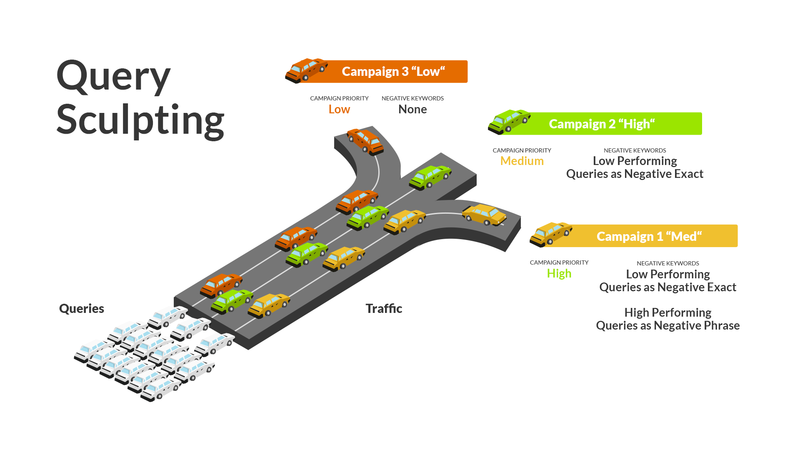 To filter queries into the right campaign, Martin uses negative keywords and the campaign priorities feature. To make sure that the correct ad from the brand campaign is shown, you need to add negative keywords with brand names in the campaign with the highest priority. In addition, you need to set the correct campaign priority (low, medium and high) — without the right campaign priorities, the wrong ad might show up. You can, however, use any internal structure for your campaign as long as you do not wish to take different devices into consideration. 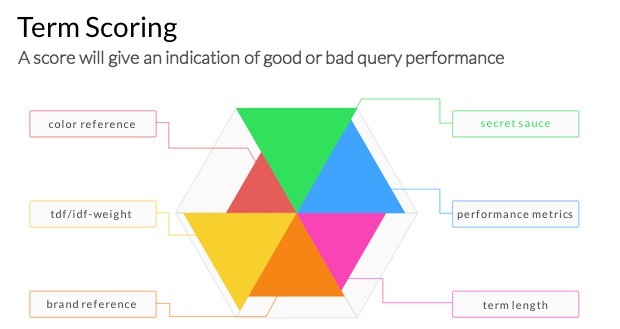 The need to research patterns first have this approach its name: EXPLICIT query sculpting. You need to evaluate queries manually based on your personal experience and the data you have — But what if your assortment does not contain well-known brands? Explicit query sculpting may only work with several well-known brands and products in the account. Without a doubt, Martin’s approach is great and he deserves all the attention he gets from the PPC community. However, you can go even further and include more dimensions — not just brand, non-brand and unique SKUs. The approach of Reinhard Einwagner (our Head of Product Development) does exactly this. It extends the explicit query sculpting approach with the dimension of term scoring. The big difference is that we are not clustering queries into brand or non-brand. Instead, we use a scoring system based on numerous factors. The big advantage: it also works if you don’t have many brands in your account because you can add any criteria to build a more objective and meaningful score. Query Sculpting: Is it worth it? Both approaches, whether implicit and explicit Query Sculpting, are not easy to implement. You should ask yourself if it is really worth the time and strain on resources to build up a completely new account structure. From our experience, the biggest hurdle is the number of conversions: If you want to start with explicit query sculpting, you need at least 200 conversions per month in one target country. For the even more advanced implicit query sculpting, 1000 conversions should be the absolute bottom line. At the same time, you need to check and update negative keywords regularly. I just made a quick analysis of some accounts that use Martin’s query-level bidding to check the performance. Note: This was not a profound in-depth analysis but I found that some performed well, while others did not. A general statement and recommendation for or against query sculpting can, therefore, not be made. It depends on your assortment and many other factors — But some of our customers had remarkable success with query sculpting. If you’re undecided, the best bet is to ask a Google Shopping expert who is already familiar with this kind of account structure. Finding the right bid is not a guessing game. You should always rely on hard facts and historical data. But what about new products in your catalog? There’s no historical performance data for them. If your products are new (or you struggle with sparse performance data in general), it’s hard to predict the conversion potential of items and to set accurate bids. Our tool Whoop! solves this problem by analyzing the potentials of similar products, brands and categories to calculate the best possible bids. Conclusion: Query Sculpting is a great way to avoid black box bidding and to use the insights of your account for a personalized and more efficient account structure. Think about it! Viljem is a true web enthusiast. He has a real interdisciplinary view on technical and economical problems.